Many denture wearers hate their dentures. They move around while they are talking or eating and come out at embarrassing times. Then there is the very serious issue of facial collapse. What happens to a denture patient over the course of ten to twenty years is that their jawbone shrinks. This condition can become so bad that it can become impossible to wear a denture. Visit our facial collapse page to learn more about this condition. Many denture patients or candidates would love to have dental implants. The problem is, they simply can afford it. Dental implants can be used stabilize your denture, improve your chewing efficiency, prevent facial collapse, and restore your confidence. One of the affordable dental implant options Dr. Collins offers is snap-on dentures. Dentures are usually stabilized with four to eight dental implants, but in this case, just two implants are used to provide stability. 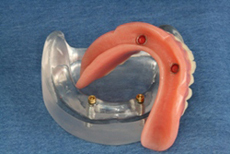 O-rings are embedded in the denture base and enable it to snap onto the implants. For increased stability, multiple implants can be used. The total cost is proportional to the number of implants that are placed. To learn more, please visit our implant-supported overdentures page. If you are price-shopping when it comes to dental implants, we strongly advise that you be cautious. Experience matters and it can be affordable if you can get snap-on dentures or implant overdentures from a dentist with strong implant credentials like Dr. Collins. But when they are done by a dentist without the necessary training and experience, the cost can skyrocket when you encounter problems. We have heard of horror stories where implants have become loose or even fell out, or others that have been misplaced in the sinuses. There are cheap alternatives out there. Quality dental implant fixtures may cost more, but their effectiveness over time is worth it. When a dentist compromises on quality, a substandard product can result in serious and costly problems like infection or nerve damage in the face.